Design Registers | View by object | Ceramic shapes | Miscellaneous | The "Ne plus ultra" dental spittoon. You are here: Home > Exhibitions > Design Registers > View by object > Ceramic shapes > Miscellaneous > The "Ne plus ultra" dental spittoon. 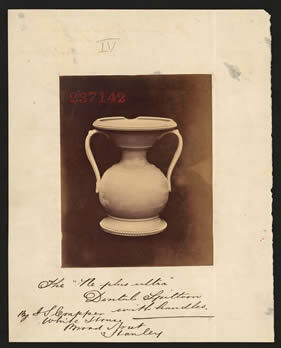 237142 - J S Crapper - 14 December 1869 - The "Ne plus ultra" dental spittoon. Subject of design: The "Ne plus ultra" dental spittoon. The "Ne plus ultra" Dental Spittoon with handles By J S Crapper, White House, Broad Street, Hanley.